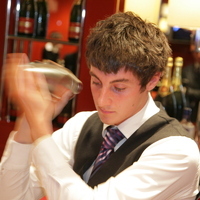 A while ago I posted about The Galvin Cup, the mixology competition to be held at The Dorchester in London tomorrow, which I have the honour of helping to judge. I’m very excited to be a part of what promises to be a spectacular event and in preparation I’ve bought one of the cocktail bibles, recommended to me by a colleague: ‘The Craft of the Cocktail’ which I shall be reading intently this evening. For news and a few words from the Galvin Cup committee, including myself, take a look at the Galvin Cup blog and if you can, come along to watch the action. But if you can’t make it don’t worry, as I’ll be Twittering from the event to bring you the very latest as it unfolds and I’ll be sure to blog all about it for you afterwards. In the meantime, let me know: what’s your favourite cocktail? Latest favourite is "The Blitz" served at the Blitz WWII-themed club nights – vodka, lemon juice, elderflower cordial and champagne. Ohsogood. My favorite cocktail is simple and sinful… baileys irishcream on the rocks.